Hey everyone! First, thank you sooo much for reading and enjoying The Skybox here! 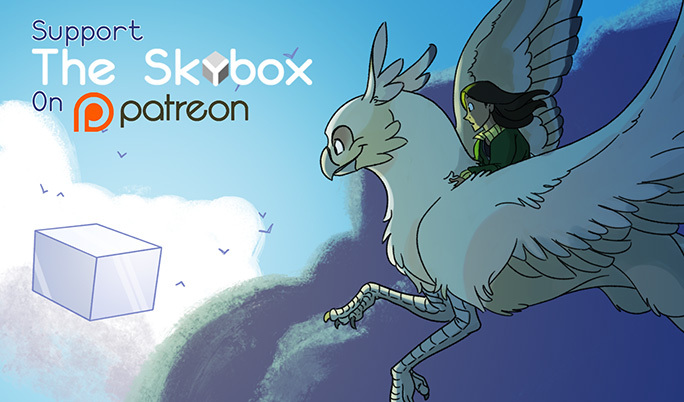 It’s taken me awhile, but I’ve finally gotten around to doing it...there is now a Patreon for The Skybox! It would mean a whole lot to me if you could help support the comic there. Patrons will get monthly rewards, and help save up for ways to get the comic into other places, such as mobile or in print! So please, take a look and become a patron if you’re able! I love working on this comic, and would love to bring even more of it to you! Aaaand ‘The Skybox’ now begins TODAY! For the first 8 updates, check back here every day for new comics! After that, updates will be weekly, every Tuesday. A little something to keep in mind for all updates in the future: this comic is presented as a storyboard animatic, which means each update has anywhere from 10-30 panels. You can navigate through these with the arrows in the flash file itself, or just with the arrows on your keyboard if you’re extra lazy. Whatever works for you! Thank you in advance for reading! Comic Launch on Dec 9th! The Skybox launches on December 9th! After over a year of prep, it’s finally ready! The Skybox is a brand new webcomic drawn and presented in the style of a storyboard animatic. The story begins with Shanti, an overworked and rather skeptical high schooler. En route to India for a family visit, her plane crashes, but she is saved by a creature calling itself a Gryphside. He claims that he cannot land, but that he can take her to a mysterious, roaming cube floating 45,000 feet in the air...a landing his kind call the Skybox. The first 7-8 updates will be daily in order to get the story really rolling. Afterwards, the comic will be updated weekly. So be sure to drop by Monday, December 9th when things kick off!